Anyway, my goals for the year were as follows. 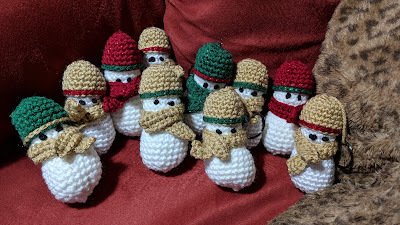 I had 10 cross stitch finishes (all mill hill kits), 25 crochet finishes (many small snowmen and ruffle scarves), and 1 knitting finish. Merry Christmas to all. 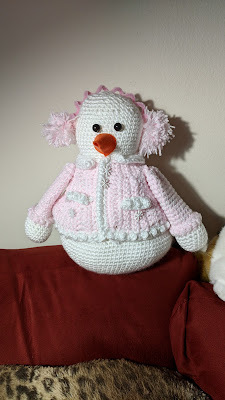 I completely forgot that I made the snowwoman last week. I waited to take a picture until I could secure the nose, but she had tumbled into a hole behind a box and escaped me. 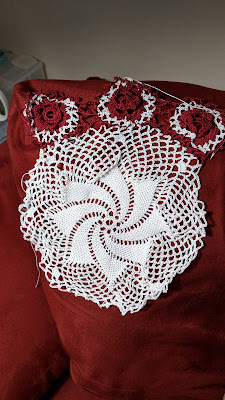 I fixed the doily, but was noticing small bumps on my pinky that I hadn't had in a while. So until that clears up, I switched to a normal hook and started on a granny square afghan. 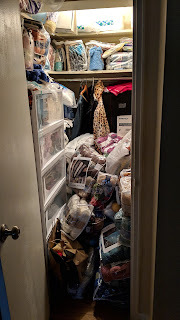 I can also finally show some of the presents I made. The cowl was for a friend I know reads this blog, the pineapple purse for her granddaughter. This is part of the display at the restaurant we go to on Christmas Eve. Here's some of Clyde, trying to look innocent before attempting to get in the bag, on the afghan I made my parents, and playing with his new toy. And now for some presents I bought myself. I ordered the "dragon theme" Fairy Loot box and this is what came in it, including a yet to be released book (on the right). These charts were on clearance from HAED. So I've been working on this doily this week. And just tonight I realized I chained 5 instead of 6 on the final white round of two of the flowers. Then I realized after making 3 more, that I should've connected 1 less time on the main one. So I'm going to have to frog all but the first. And I had another photo shoot with Clyde. When I came in, he went up the stairs and flopped down like this. These are the best of the rest as I was preparing to leave. And this ornament for my tree. And here's Clyde in a box. So I had a extended visit from the frog. I messed up on the "pinks" There are 7, when I started #6, I realized I messed up. Only had 2 colors correct so I frogged everything except those and redid them. Took a lot longer than I had hoped. Now just need to cut it out and add a hanger. 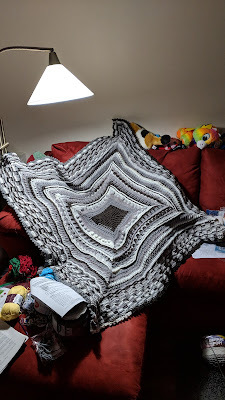 The Summer CAL afghan is complete. 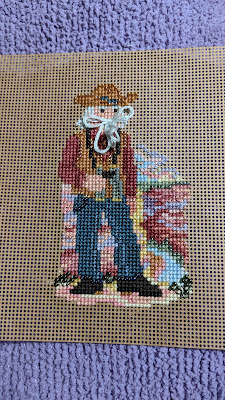 Working on more gifts now. Thankfully have a week off coming up. Splurged on Etsy a bit with Cyber Monday, here's a few.